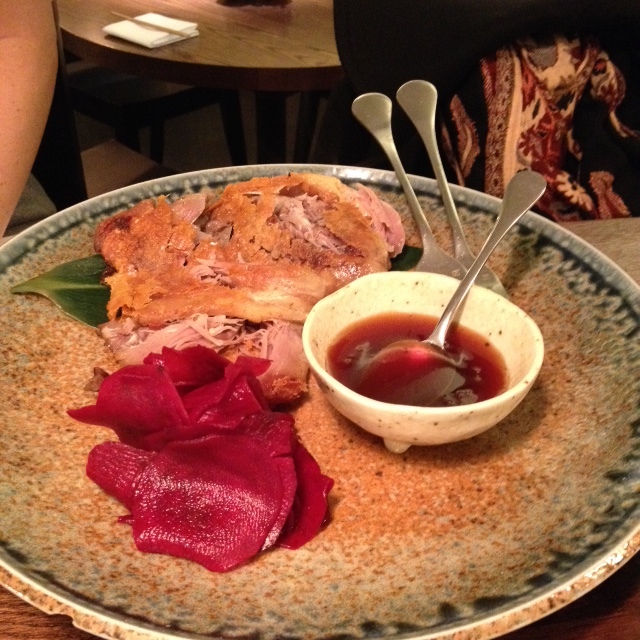 When Caroline and I went to Flesh and Buns in the beginning of December the restaurant was fairly newly opened. Two months later it is not the talk of the town anymore but still worth mentioning to you, dear readers. It is the team behind lovely Bone Daddies Ramen Bar in Soho who is behind Flesh & Buns too, and I understand the need for opening up a larger restaurant. The seating area in Flesh & Buns must be at least triple the noodle bar space. It feels more relaxed and spacious but does lack a little bit of the cosy atmosphere of its noddle bar sister. 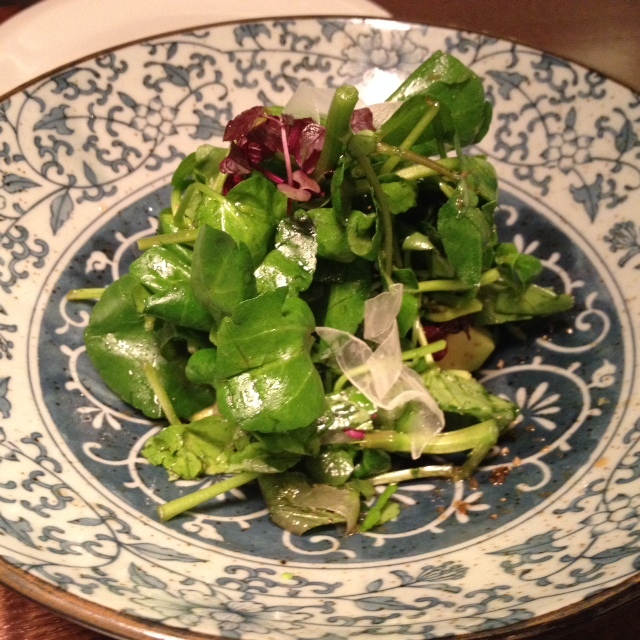 First up was a watercress salad with avocado and shiso. It was simple and fresh and the dressing fantastic. Next we tried a sushi roll as the person next to us had some and it looked really good. 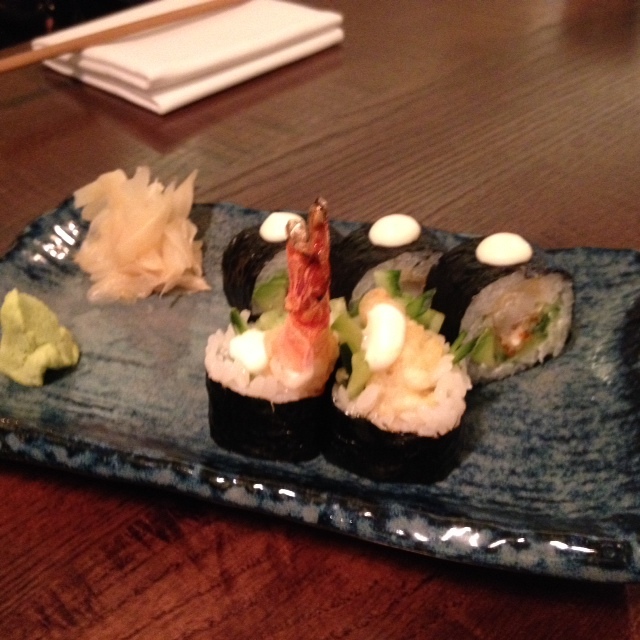 The shrimp tempura roll was nice and well made but sadly didn’t measure up to Yashin or Tsunami’s sushi. The pig bones, i.e. 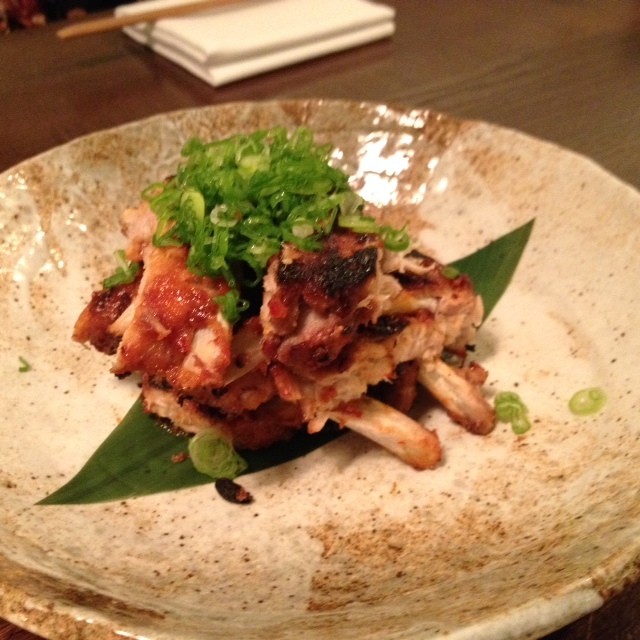 ribs, were sweet and sticky with their miso marinade and fell off the bone. One of my favourite dishes. Beef scewers with kimchi and yoghurt were succulent and tasty but not amazing. 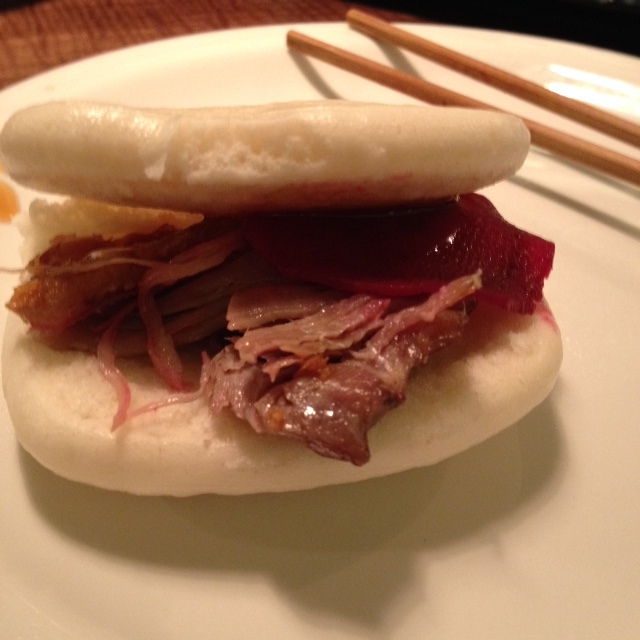 Lastly we tried some buns with duck leg, crispy skin, thinly sliced pickled beetroot and hoisin sauce. The fluffy pale buns are similar to pork buns in texture but these you fill yourself. It was nice and I like the idea of filling your own bun, but I wasn’t blown away. Compared to Bone Daddies I feel that Flesh & Bun are lacking in a few areas. 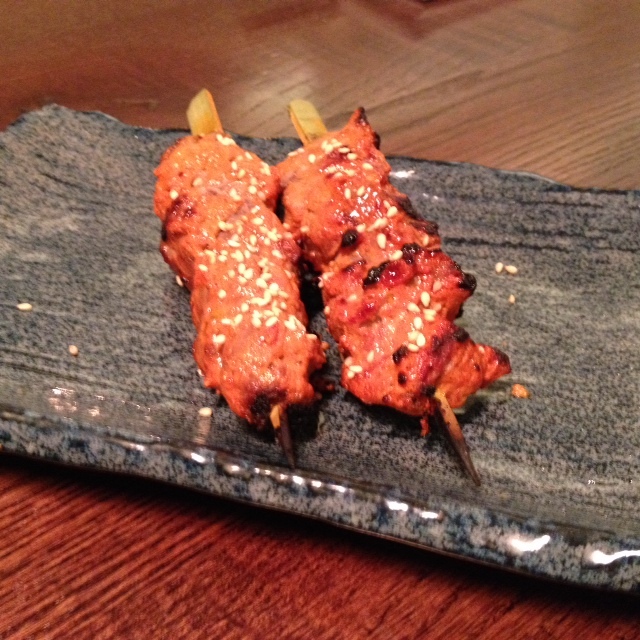 The atmosphere and interior feels warmer and cosier at the former and the menu feels more put together there too. 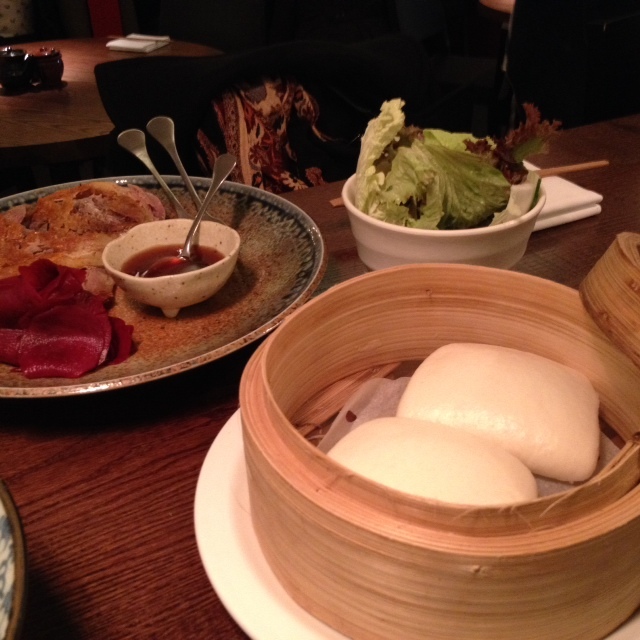 It’s still early days for Flesh & Buns and I hope they can improve because there is definitely room for this type of restaurant in Covent Garden.